OCCO is one of those brands that had been on my radar for many, many months but was continually superseded by other products more demanding of my attention when presented with the opportunity to purchase. With close inspirational links to the Dalmation Coast and Adriatic Sea, you might be surprised to learn that the products are formulated within the UK and are the brainchild of ex-Spa Director at Molton Brown, Anna Doyle. I decided that I wanted a new candle for the bedroom last week whilst mooching around John Lewis. I wanted something with enough spice to be warming without being full-on “boudoir”. Not that there’s anything wrong with full-on boudoir, but I’ll save that headiness for when the weather is cooler. I couldn’t find anything that tugged at my sleeve harder than this beauty from OCCO’s Raiyia range. The styling is a little retro with concentric circles and a 70s mustard theme but the scent is thoroughly modern. 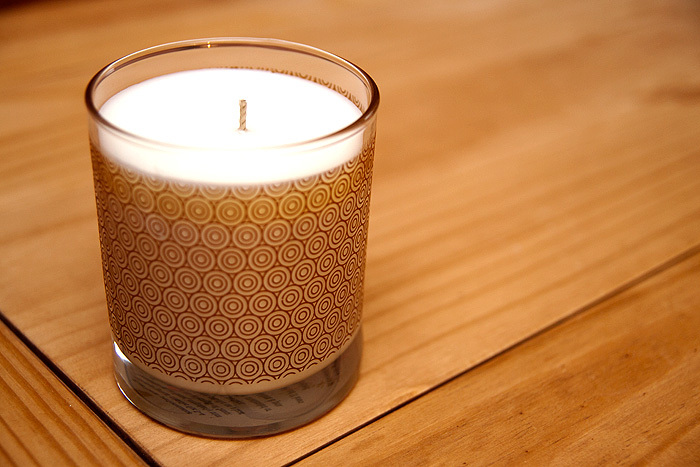 The 210g candle promises to contain a minimum of 95% natural ingredients and 100% natural fragrances. A spicy citrus with Bergamot, Petitgrain (<3) and Nutmeg ensures that this walks the olfactory line between Summer and Autumn quite beautifully. It fills the room confidently without being blousey or demanding, I think that it would work well in most home environments as both a relaxing, and at the same time, uplifting scent. I do wish the packaging were a little more luxe for the price (£35) but I can’t fault the quality of the candle which burns both evenly and cleanly. If I remember correctly, this is the candle that Danni Minogue tweeted a picture of as her favourite for burning in her X-Factor dressing room last year. Now that I’ve finally taken the plunge into the OCCO family, I will keep the range in mind and return to investigate some of the other fragrances available. Most importantly, I may have to be quick about it — the range was heavily discounted, I’m wondering if it perhaps won’t be around for much longer. 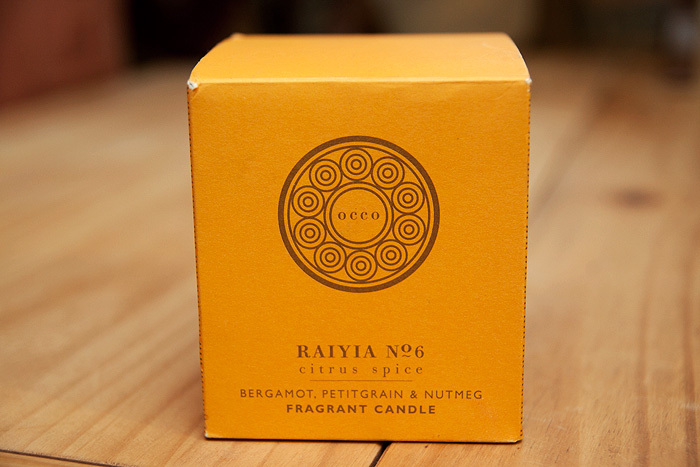 OCCO Raiyia No6 Citrus Spice Candle is priced at £35 for 210g and available online at Occo or reduced both online and instore at John Lewis. I am a sucker for anything citrus. Looks great! I bought their lipbalm at TKMaxx and was a bit frustrated how big the packaging is (the box and the protective cardboard inside) compared to the jar with the lipbalm, lol. It’s kind of a waste of material. A tiny correction, it’s not DalmatiOn coast, it’s DalmatiAn coast.